Vijay Sethupathi's next titled Sethupathi? Vijay Sethupathi's upcoming film directed by Arun Kumar of Pannaiyarum Padminiyum fame has been named after him as Sethupathi. The other attraction of this action packed entertainer is that the actor pairs with Remya Nambeesan of Pizza after four long years. Writer Vela Ramamoorthy play an important role in the movie. The actor dons khaki for the first time in this movie, which is said to showcase a bravery and honest nature of a policeman in reflecting the real essence of reality. Music of the film is by Nivas K. Prasanna. The pre-production process of the film is on its final phase and the shooting will start by September. 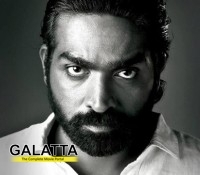 Stay tuned with Galatta.com for further updates on this Vansan Movies production. >>Pizza to be dubbed in English!